We price by the job, not the hour. You approve the price before we start the work. We offer super fast emergency response 7 days a week, including holidays at no extra cost. 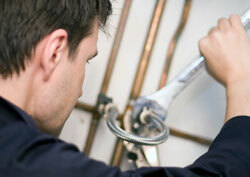 When it comes to pipe damage, it’s not a question of if it will occur, rather when it will occur. When will a water or drain pipe start to leak in your aging home? Leaking water pipes if left unattended can lead to damage to your walls and ceilings. This damage if neglected long enough may turn into a nasty mold problem. At American Specialty Plumbing all of our service trucks are well equipped with hundreds of different sizes and types of pipes, fittings and tools to quickly and cleanly remedy any sized leaking pipe issue. So call American Specialty Co. today to schedule a pipe technician in your home today! Serving Clark, Westfield, Summit, Scotch Plains, Bedminster, Far Hills, Bernardsville, Basking Ridge, and Livingston!